Review posted November 27, 2018. Crown Books for Young Readers, 2017. 28 pages. Yes! This is the very best sort of counting book – with multiple things to count on each page. In the picture we do see four paws on the kitty cat, but also four stripes on its tail. We see four froggies on the bathroom mat, and we also see four rubber duckies in the room. There are four shampoo bottles on the side of the tub, four toy turtles, four rolled-up towels, four stripes on the towel the dad is holding, four dots on the stool, and four bubbles in a framed picture (with framed spaces for ten things – this is consistent on each page). Mind you, the rhyming text is simply nice, not stellar. But it’s not glaringly bad, either, which is an accomplishment with rhyming text! The pictures are soft and sweet – and so many things to count! Another example on the Five page is the Mom has a necklace with five daisies, and each daisy has five petals. The back of the book has a note to the parent/grandparent/caregiver reading the book. It points out the educational value, in case they missed it, and gives more ideas for bringing numbers into children’s lives. This book would pair well with the bedtimemath.org website and app. They recommend doing math problems with your child at bedtime, as well as bedtime stories. This book is both! 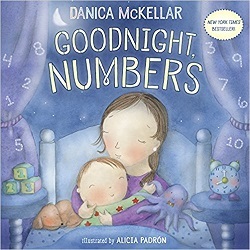 This is a great way to talk about numbers and counting in a cozy and friendly way. It’s never too early to show your children that math is all around them.